With over 31 years of experience in the medical field, Dr. Budaj opened Bloomfield Wellness Clinic in 1998 to bring natural healing to West Bloomfield and the surrounding communities of Farmington Hills, Bloomfield Township, Walled Lake, Southfield, Novi, and Warren. We’re here to lead you to wellness by teaching and healing naturally. 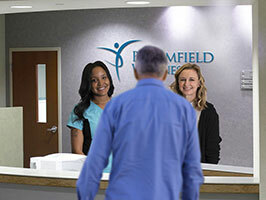 From babies to the elderly, from relieving your pain to bringing you long-term health, Bloomfield Wellness Clinic is here for you. Our focus is on Functional Medicine, which focuses on interactions between your environment and the internal systems of the body. We don’t just look at your symptoms and how to get rid of them—we study your individual lifestyle to develop a plan that will give you the best health. Bringing you the best of healing means using all methods at our disposal, and that’s exactly what you’ll get at Bloomfield Wellness Clinic, we combine western and alternative medicine to bring you the best of healing and help you change your lifestyle. Dr. Budaj’s background in the medical field is complemented by his doctorate degree in chiropractic and his education in nutrition, homeopathy, and herbology to bring you true elimination of your problems and disease. He regularly attends continuing education courses to further his knowledge and bring the best to his patients. By balancing your body’s systems through chiropractic and nutrition and utilizing testing such as blood work and hormonal levels, we’ll help you reach your body’s fullest potential. In addition, we use healing cold laser therapy that will further speed your healing process. We accept most major insurance plans, as well as being here for personal injury cases and auto accident victims.